Since 1958, WD-40 has been a household saviour and favourite multi-purpose problem solver for millions of people across the globe. I'm sure everyone has at least once used it to stop a squeak, make a sticking drawer glide open, or loosen a stuck nut. Initially developed as a rust preventer and de-greaser, there are thousands of other uses for this amazing product, with more and more being discovered every year. If you're a fan, you might even belong to the growingWD-40 fan club, which boasts over 100,000 members (Take that Justin Bieber). First, a little history. Along with only 2 employees, Norm Larsen founded the Rocket Chemical Company in the United States in 1953. He set out to develop a rust-preventing solvent and degreaser for the aerospace industry. On the 40th try they succeeded in creating a 'water-displacement compound'. 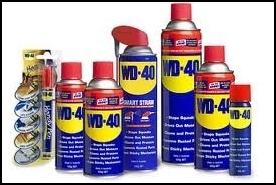 The name WD-40 stands for 'Water Displacement - 40th try'. Since it was put in an aerosol can, and made available to the general public in 1958, millions of cans are produced each week in the U.S. alone, and it has become a life-saver and a favourite with families and people from all walks of life. Here are just 10 not-so-conventional (and some downright weird)uses for WD-40. 1. 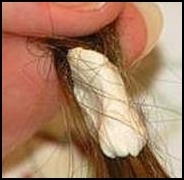 Removing chewing gum from hair: It's your worst nightmare and if you're a parent who has lived this (as I have) you don't have to run for the scissors (as I did). Simply spray the gummy hair with WD-40 and the gum will easily comb out. Make sure you are in a well ventilated area and avoid contact with the child's eyes. 2. Clean toilet bowls: If you think you'll never get the stains from your toilet bowl, then think again. Spray a little WD-40 into the bowl to clean ugly gunk and lime stains. Leave for a few seconds and swish around with a nylon toilet brush. The solvents in WD-40 will help dissolve stains. 3. Remove old decals: You don't need a razor blade to remove old decals, bumper stickers or tape. Just spray with WD-40, wait about 30 seconds and wipe them away. Works on registration stickers like magic. 4. Remove carpet stains: If regular carpet cleaner won't shift stubborn stains from your carpet, spray the stain with WD-40. Wait a minute or two, then use your regular cleaner, or warm soapy water. The stain will disappear. If it's an old stain, you may have to repeat. 5. 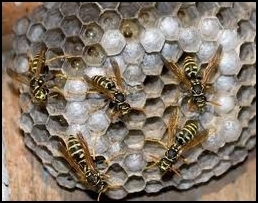 Prevent wasps from building nests: Wasps love to build nests under your eaves. Spray some WD-40 under all the eaves of your house to stop them. 6. Waterproof your boots or shoes: Keep your boots and shoes from getting soaked through by giving them a coat of WD-40.Simply spray on and wipe over with a clean rag. They'll look as good as new. 7. Relieve the pain of a bee-sting: I don't have the scientific reason, but for fast relief of a bee, wasp or hornet sting, just spray WD-40 directly on the site and it will instantly relieve the ouch. 8. Keep flies off your cows: If flies are tormenting your cows or horses, spray on some WD-40. Flies hate the smell - but be careful not to get it in their eyes. 9. Temporarily relieve joint pain: Not just for creaky doors - WD-40 has been reported to ease the pain of creaky joints.Some arthritis sufferers swear that by spraying on some WD-40 and rubbing it in, it provides temporary relief. Obviously for severe or persistent pain, you should see your healthcare professional. 10. Remove burrs from animal fur: Your horse's mane or tail can become full of burrs which are hard to remove without cutting them out, or tearing their hair. Just spray on some WD-40 and the burrs will slide out. Those are just some of the more surprising uses for this amazing substance. It's like having your own personal genie to get you out of all kinds of sticky situations. You can check out the official 2000 uses for yourself and become a fan. Perhaps you've discovered an unconventional way to use WD-40 yourself and would like to contribute. I loved this article - because I've thought WD was so great for a long time. I recently tried to find out how to re-ink a typewriter ribbon, and it is also used to help the ink stick! Fabulous stuff. Thank you for the feedback! Much appreciated. It also cleans stainless steal. Keeps it clean for ages! I tried it on the toilet bowl as you suggested and you're right it works a treat! I've been trying to get rid of the stain for ages, and I didn't think I'd be able to. WD40 really is magic stuff. It also removes crayon from plastic tables and walls, and also takes off tape marks from when you've hung pictures. Great stuff.